A delegation from Abdul Wali Khan University Mardan, led by Mr. Azmat Ali Khan (Assistant Professor, also entitled by NDU as Ambassador of AWKUM), Department of Political Science, along with students Miss Sireen (M.A. 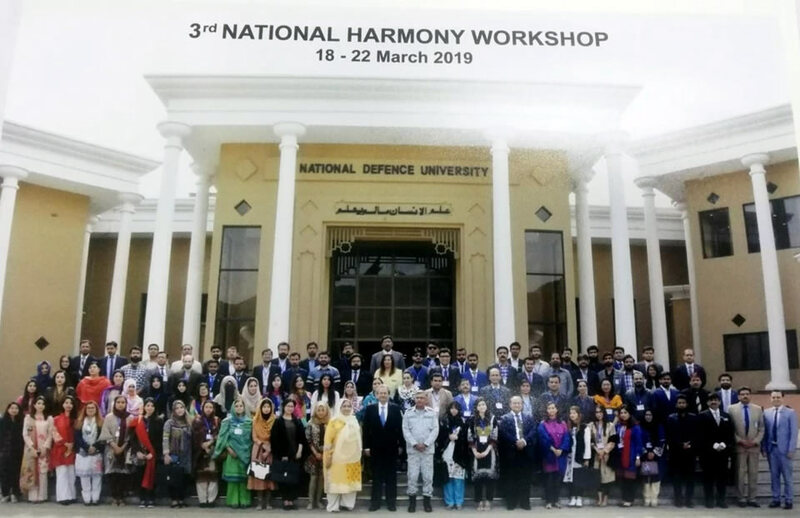 Psychology), Mr. Faizan (BS International Relations), attended a week long workshop entitled, “3rd National Harmony Workshop, (18-22 March, 2019), arranged by National Defence University (NDU) Islamabad. Delegations from all over Pakistani Universities attended the workshop. The sole purpose of workshop was to highlight that Pakistan is a multi-ethnic society, alienated geographically among separate regions, with different cultures, languages, and socio-economic structures like many other countries around the globe. Since many years, Pakistan is going through serious internal and external security challenges. It is realized that lack of national unity and integration among the federating units is one of the major weaknesses that has accentuated these challenges. Pakistan needs a national platform to bring her divergent linguistic and geographic groups together for some common national goals. Since there was no such mechanism where the universities could be engaged in such an exercise, NDU realized its national responsibility and launched a project “MANZIL E MURAD” in 2015, which proved a success in achieving its goal. 2nd workshop was organized in 2017. In continuation to this national project, dedicated and continued effort is pre-requisite to build the required degree of cohesion and common understanding among the people of all the federating units. Universities and institutions being the think tanks can play an important role in facilitating national harmony and integration. Objectives of the workshop included; to enhance national harmony and integration, generate a sense of ownership among the academic community of all federating units regarding national issues, to improve national pride and awareness among university students and academia on security environment and role of Pakistan Armed Forces towards stability and peace in Pakistan, and to share common understanding regarding the possible solutions to existing problems in Pakistan. The cleavages along the lines of traditional attachments are fundamental to any plural societies as in Pakistan. Expert speakers from the federal government and military experts talked on the said issues and national security responding to multiple questions asked by the participants.